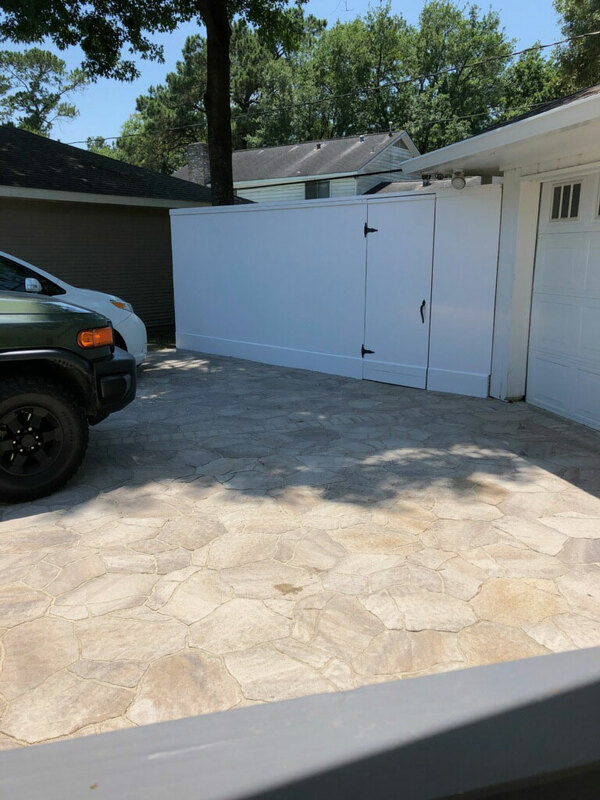 If it’s true that good fences make good neighbors, then this recent project will be making the whole neighborhood happy. I was contacted by Jan who began as a student and client years ago and has become a dear friend. 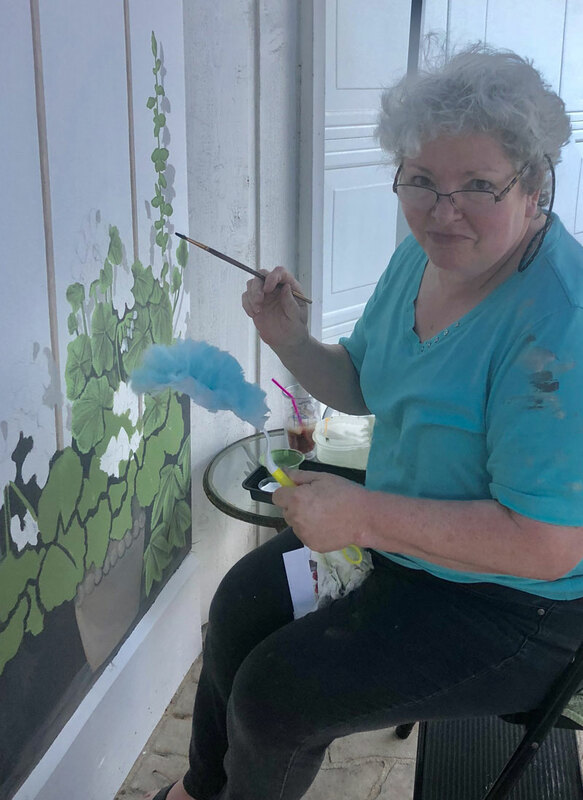 I met Jan over a decade ago at the school of Anything but Plain Decorative Finishes in Houston where I taught workshops in mural painting, trompe l’oeil and perspective drawing amongst many other classes. Jan took a class and at the end took me up on the request I make of students: stay in touch, send me pictures. 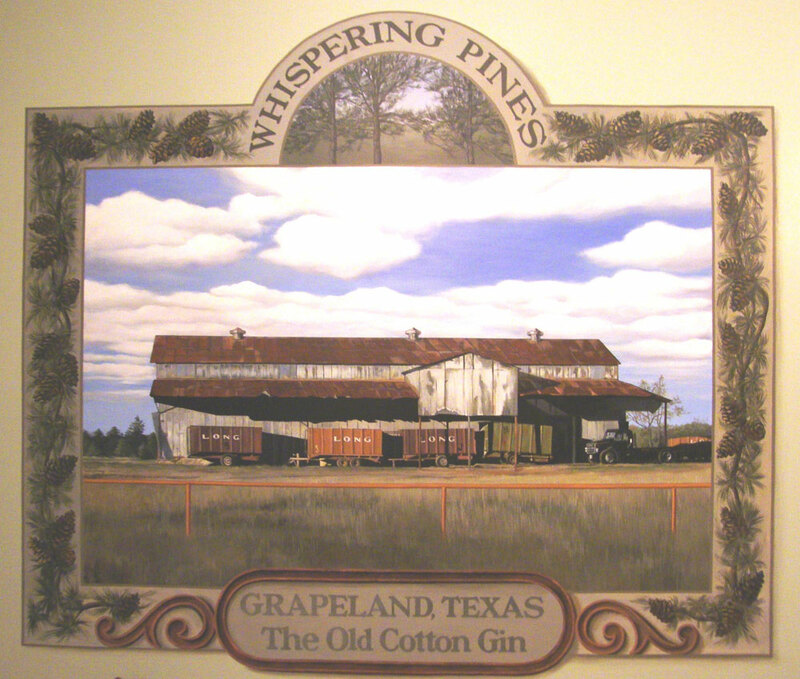 She did exactly that and then one day asked me to come to her newly built home in Grapeland, Texas to paint a mural. 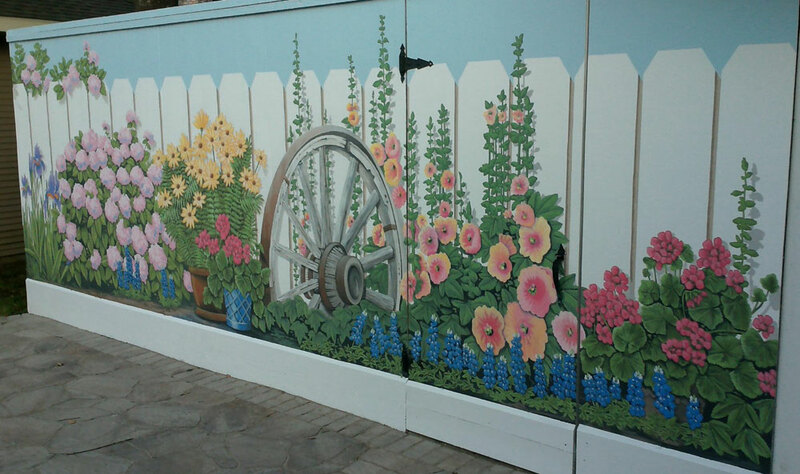 It would be the first of many murals I would come to paint there. A treat every single time as I fell under the charms of the peacefulness of East Texas. 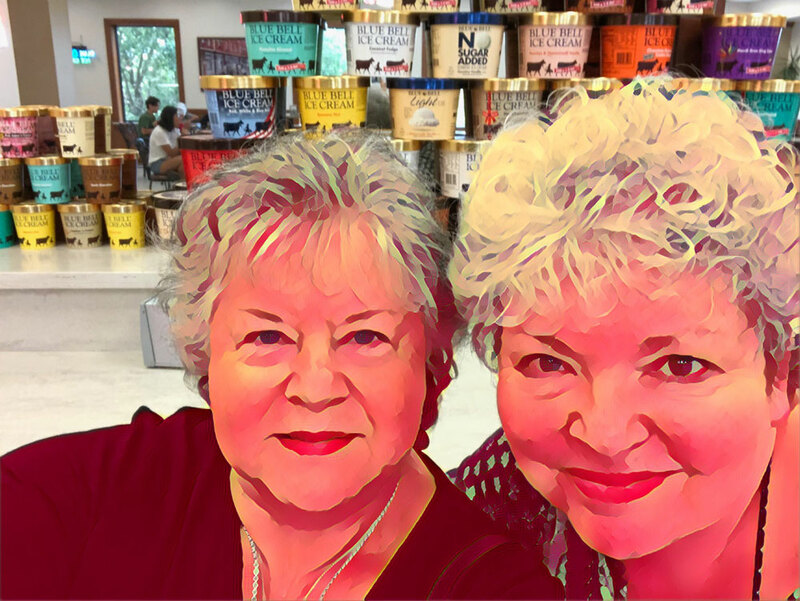 Here’s a picture of Jan and me at the Blue Bell Creameries, home of arguably the best ice cream in the country. 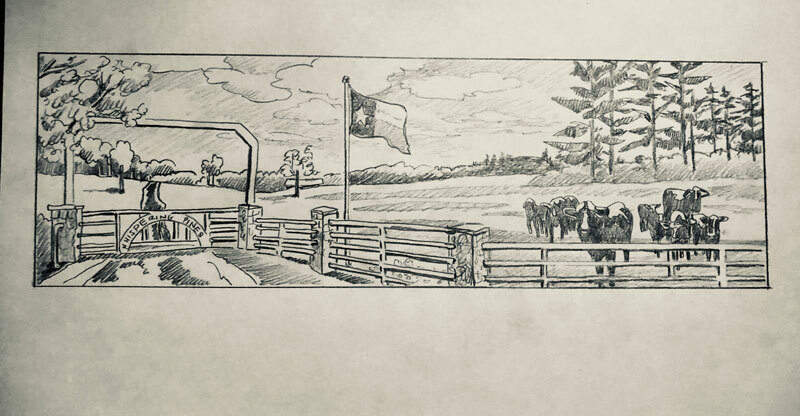 This project brought many aspects of my Texas connections together. 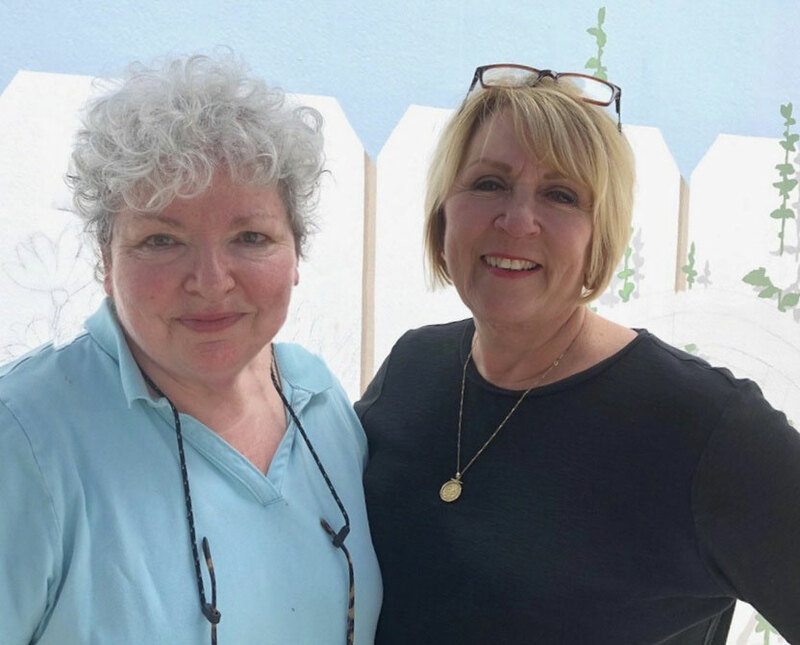 Amongst my visitors while working was Janie Ellis, founder of Anything But Plain, another of the gifts that Texas has given me, a colleague who transforms over the years into friend, and remains that sound bouncing board that has helped me grow as an artist. If I haven’t said it enough, Janie, thank you for helping me metamorphosis albeit unwillingly at first, into a teacher which in turn made me a much stronger artist. I am working on fearless. So now, the reason I was in Texas again, with the temps over 90 and the mosquitos and Texas fire ants lying in wait. 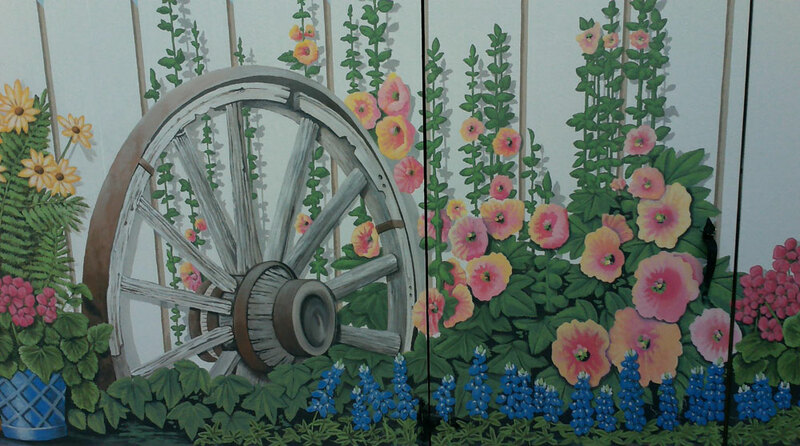 Jan had moved to a new home in Houston and asked for my help in making a vision she had come to life. There was an 18′ long fence attached to her garage, calling for something. 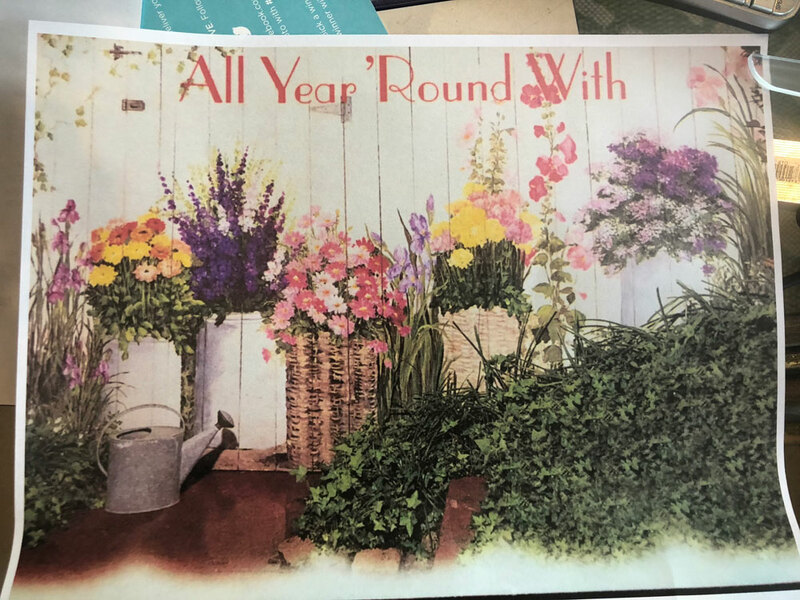 She had seen a painted fence years ago in a paint company ad and sent it to me as a starting place. Her husband Bruce though perhaps it might be better before the artwork began, to give some consideration to the fence itself. He had the face of it refitted with concrete board and then primed and painted to provide me with an 18′ by 6′ canvas. 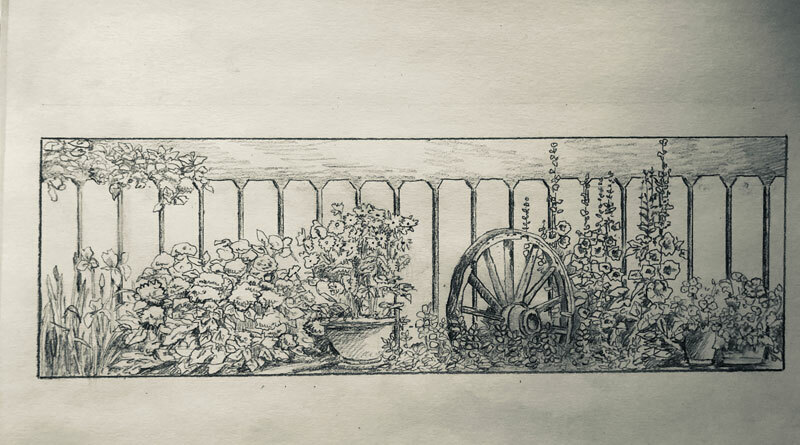 These are two of the early scaled drawings. After much discussion, we chose the closest adaptation of the original sketch. And so the painting begins. Knowing how grueling the work would be outside, I made pounce patterns of the large sections of the design. Pouncing is a method of drawing a design out on paper and going over the lines with a small wheel that cuts holes into the paper. 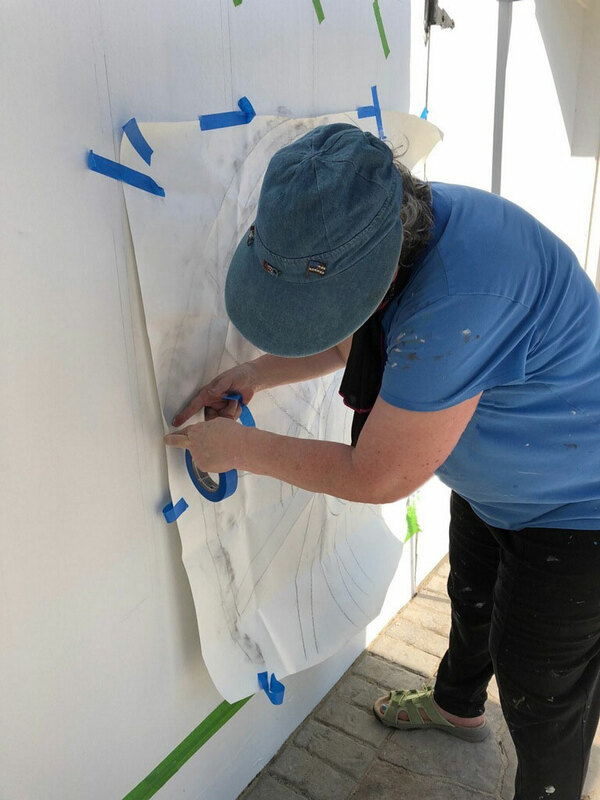 After it is taped into place, a pad filled with ground charcoal powder (interesting explaining what this is to airport security ), and using a pouncing motion, the design is transferred to the surface to be painted. One of my old sign painting methods that has served me well. The work of making the pounce gets done in air conditioning and cuts down the drawing time on the wall. By the end of the first day with storm clouds dumping buckets on my little pop up tent, Jan arrived at a solution. Huge ten foot wide pieces of plastic were secured from the back of the fence, over the pop up tent and then anchored by Jan’s husband’s jeep. Not a piece of duct tape touched that jeep, Bruce. I promise. 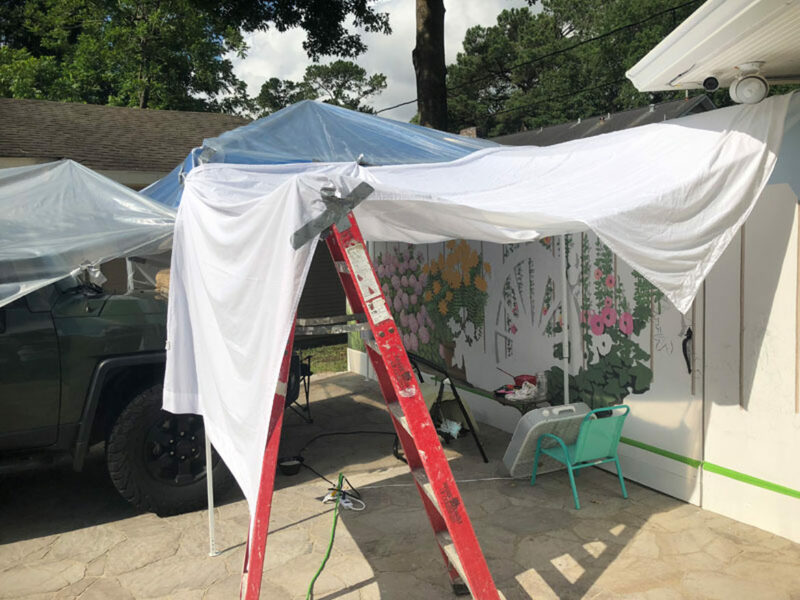 Then sheets were attached to the sides to block out sun, and then the brilliant suggestion of Jan’s daughter Melissa, to add a second opposing fan that really helped with the heat and keeping the bugs away. Well, most of the bugs. I found a swifter in my left hand helped battle the most belligerant bugs late evening. Doses of sunscreen, baby oil lotion and Off! helped as well. My set up looked every inch as a worth entry into a gypsy camp. Every so often, I braved the elements to get at sections outside the tent. Work began most days at first light, just after 6am, and with a few breaks, ended at sunset. So, without further ado, here is what it looked like when completed. 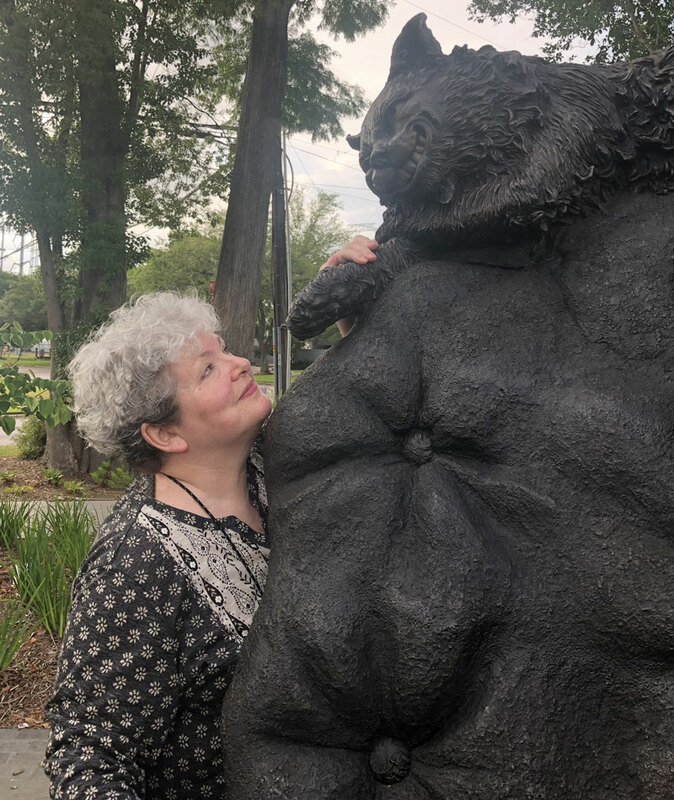 As much as I did truly enjoy this challenge, I’d be remiss not to share one gem Jan brought me to see in Bellaire, Texas, about ten minutes from her home. 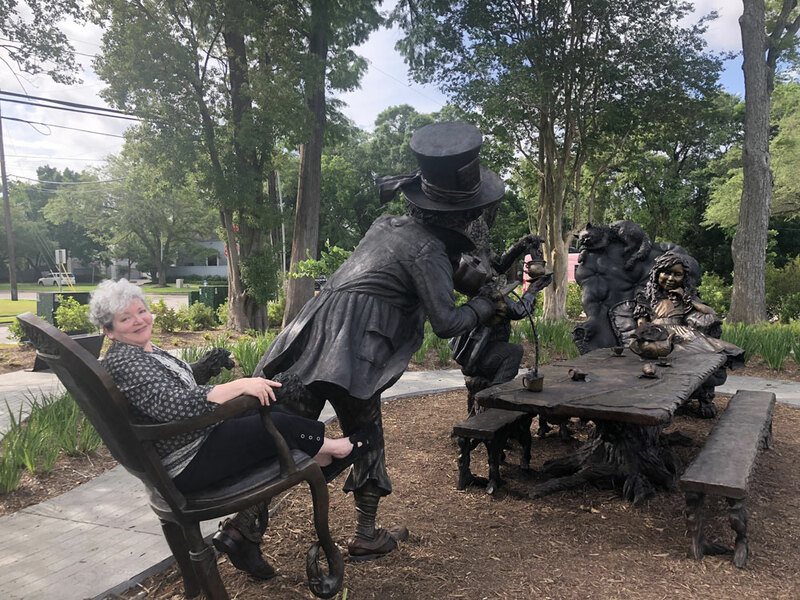 I went to Evelyn’s Park to see the huge cast bronze sculture of Alice in Wonderland with the Mad Hatter and March Hare. It took my breath away. 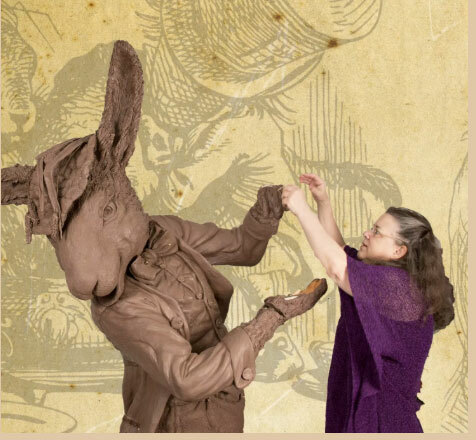 If superbly executed whimsy appeals to you (“Curiouser and curiouser”?) see more about the sculptor Bridgette Mongeon. and check out her Facebook page www.facebook.com/FindingAliceSculpture/. There are tons of photos and links to her website. I felt like a kid there myself. I’m back home. 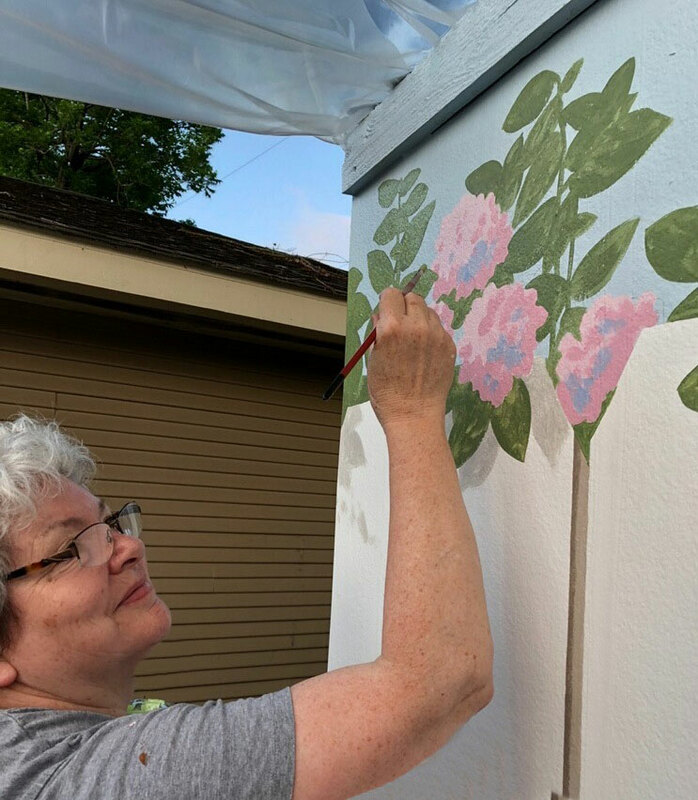 To be honest, I don’t miss the Texas sun and humidity but balanced amongst spending the time with a friend while working and creating her dream in paint, I’m way ahead of the game.